Auto makers are planning the next-generation passenger experience to embrace the content explosion brought by smartphones and cloud connectivity. From embedded functions such as on-board navigation and satellite radio, to gesture recognition and Internet applications, infotainment growth for the connected car is driving the need for flexible and adaptable solutions. Infotainment SoCs supporting real-time multimedia networks and incorporating the latest interface IP standards and protocols in emerging automotive operating systems require a broad, high-quality IP portfolio for automotive applications. Synopsys offers USB, LPDDR4, HDMI, MIPI, PCI Express®, mobile storage, security, data converters, logic libraries, embedded memories, Sensor and Control IP Subsystem, and ARC® and EV vision processors to speed SoC development in the latest 28-nm and 16/14-nm FinFET process technologies. 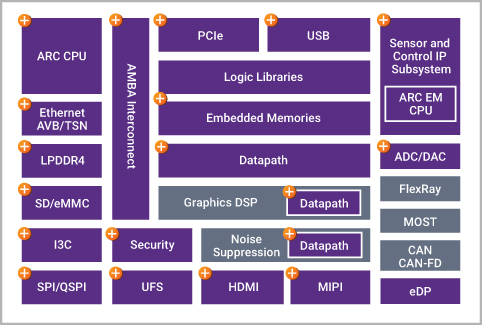 Synopsys also offers Ethernet IP that supports Audio Video Bridging (AVB) and Time Sensitive Networking (TSN) standards, and enables predictable and reliable networks for functional safety ADAS applications. Low latency, multi-port LPDDR4 controller and PHY supporting speeds up to 3200 Mbps offers multi-port access to shared main memory, enabling protocol engines for embedded vision and high-performance heterogeneous processing. Security IP for HDCP 2.2 offers increased content protection. EV vision processors offer multicore architecture for object detection implementing convolutional neural network (CNN) with OpenCV and OpenVX software programming environments.